If you grow nettles, or live in an area where they can be wildcrafted try the fresh young spring plants cooked until tender and seasoned with just a little butter. The leaves can be used raw and applied directly to the rheumatic pain area, they increase circulation and draw out pain. While most people avoid the stinging part of the nettle, those with arthritic hands deliberately prick there hands to calm inflammation and pain. Use the dried leaf in teas or sprinkled it onto food like parsley. 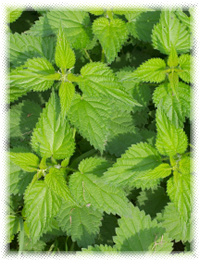 Stinging nettle makes an almost iridescent emerald green tea that is very nutritious, mild and slightly grassy.